The panel is divided into four horizontal segments carved with themes and images, both ornamental and figurative, of religious and secular content. The uppermost segment of the panel represents a man in a long garment with the heads of the lion on either side, clasped under each arm. Single birds are carved on each side of the man's head, which is missing because of the crack that runs from the top to the bottom of the panel. The bird on the right is standing on a dragon's tail. 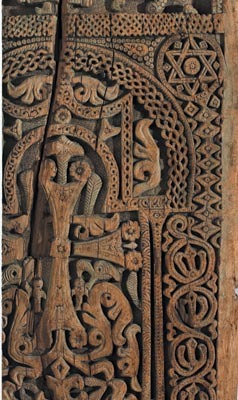 Ornamental motifs of closely tangled and knotted braiding fill the backgrounds. There are circular discs between the legs of the lions. The second segment contains the representation of a cross, placed under an arch supported by twin columns, recalling the design of the entrances of the Armenian churches of the Bagratid period of the 10th and 11th centuries. The arms of the cross are ornate, and its base rests on an interweaving plant and geometrical motif, intended as an allusion to the fertile seed whence sprouts the stem. Single birds with fish in their beaks, are placed below the horizontal arms of the cross. A six-pointed star is carved within a circle on the right-hand corner of the large arch, and an eight-pointed star is placed on the left. The cross is of the 'winged' type, that is, it has leaves sprouting at the base and symmetrically at its sides. In accordance with its symbolic implications which make reference to the tree of life, the cross also bears fruit, having sinuous shoots that branch off from the extremities, and carry various schematized bunches of grapes or pines. The third horizontal segment represents what seems to be a hunting scene. 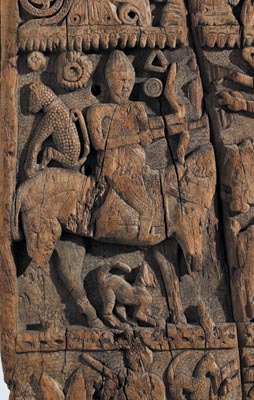 A horseman, carved on the left, is shooting a bear with an arrow. The bear is pierced by two arrows and beside it, a second bear is shown. A cheetah with a collar around its neck is seated on the horse-croup, with its back turned to the hunter. A hound is placed below the horse's belly. Another smaller cheetah, also with a collar around its neck, is carved above the arrow-stricken bear. The lowermost horizontal segment of the carved panel shows a large antelope on the right, which is being attacked by two hounds from above and behind at the same time. A hunter is also represented piercing the antelope with his lance. Unfortunately, the left side of the panel is damaged, and it is impossible to identify the image. It probably represents rich foliage. The two previous attempts to identify the iconography by J.M. Fiey (1985) and L. Chookaszian (1994) are unsatisfactory. Daniel in the lion's pit and Daniel's Vision of the Four Beasts (Daniel 6: l7-24; 7:1-7), which are unusual subjects in East Christian art, frequently appear in Armenian art. The iconography of the first uppermost segment and that of the third segment are related in that the first represents Daniel in the lion's pit, and the figuring of the beasts in the third segment has the distinctive traits of the beasts in the vision of Daniel, mentioned in the biblical text. The first, carved in the upper zone, is like a lion; next comes the second beast who was "like to a bear and it raised up itself on one side, and had three ribs in the mouth of it between the teeth of it"; the third is "like a leopard, which had upon the back of it four wings of fowl, the beast had also four heads". The fourth beast was "dreadful and terrible, and strong exceedingly; and it had great iron teeth: it devoured and brake in pieces, and stamped the residue with the feet of it, and it had ten horns and behold there came among them another horn". The circular objects between the legs of the lions in the first segment represent the sun and the moon, an allusion to Daniel's dream. The circular objects next to the large and small bear represent the 'residue'. The scene of Daniel between the lions is found sculpted on the base of the seventh century funerary stele from Haritch (Nersessian, cat.11). Bas-reliefs of Daniel represented between lions occur also in Georgian sculpture, represented in Medjoushevi (8th century), Hiza-Bavra (flanked by stone crosses on either side) and Martvili (912-957), replicated in the west in the sculptures of Neuilly in Donjon, Vouvant and Cosne. The figure of Daniel between two lions is also found on the northern facade of the Church of the Holy Cross on Aght'amar, built by the architect Manuel for King Gagik I, between 915 and 921. Parallels of this imagery are found in an Armenian Lectionary written in 1331 in the canton of Apahunik', north of Lake Van (Jerusalem, no. 95), in a Lectionary written in 1335 at the village of Vahnashen (Pierpont Morgan Library, no. 803) and in a Lectionary written in 1414 in Khizan (Chester Beatty Library, no. 599). The Monastery of Haghpat, founded in 967 or 976 by Queen Khosorvanush, the wife of Ashot 111 Bagratid, has a main church called Holy Cross, which was completed in 991 by Smbat Bagratid, then king of Armenia, and his brother Gurgen, or Kiwrike, king of Loti. A plaque embedded on the east facade represents the two donors holding a model of the church. Gurgen wears a kind of mitre and Smbat: a turban similar to the caliph's. The fretwork frieze around the drum dates from a restoration undertaken in 1188 or 1221. The walls of the interior have paintings of a Deesis combined with a theophanic vision, the Annunciation, the Nativity, the Presentation in the Temple, the Baptism of Christ, the Communion of the Apostles, and the Pentecost. The scenes are inscribed in Armenian and in Georgian. The huntsman in the hunting scene is Gurgen/Kwirike, the founder of the Kwirikian kingdom of Lori in 982. His helmet-like hat, as depicted in the woodcarving and in the facade of the Haghpat, was the head-dress of the Bagratid royal family. Professor N. Marr confirms this, in relation to the Haghpat bas-relief that, "A tall, sharp pointed hat could be usual for those Armenian kings who did not have extraordinary sovereign right, as for instance, the Lords of Lori and Gugark". The engraving on this panel depicting Daniel in the lions' den and Daniel's vision of the four beasts, fits well into the scheme of the iconography in the interior of the church dedicated to 'their salvation'.